There was one word that the Imam repeated at the end of the call for prayer than rung through New Zealand on Friday at 1.32pm. The love that was demonstrated by people opening their doors to keep the wounded safe from the gunman. The love that was seen in cars stopping to pick people up as they ran, terrified, from the massacre. The love of people baking, creating meals that respected Halal diets. A mile of flowers; hand written cards, unique designs; poetry written out on inspiration; the haka of hope; the wall of human hands. Paperchains made by school children; kapa haka groups coming together to combine talents. It seemed everyone had an absolute desire to share their love with our Muslim brothers and sisters. It has been a profound experience by any one’s estimation. We have learnt about gratitude; about graciousness; about forgiveness. In a situation which might have been expected to bring out anger, instead the Muslim community has spoken only of tolerance, of acceptance, of appreciation for the support given from right across Aotearoa. Te Pūtahitanga o Te Waipouamu kaimahi, along with Whānau Ora Navigators were quick to arrive at Hagley Community College to open our arms wide and to do our bit to help – to set tables, do dishes, transport, do the grocery shopping, make sandwiches. We thought we were helping: the reality was that the Muslim communities were instead teaching us so much. One mother spoke adoringly of her child; the child that the grandfather had saved by telling Mum to run outside. The grandfather never made it out alive, but his sacrifice will always be remembered. People as far as the eye can see. Every where around Te Waipounamu it seemed that whānau were coming out to support Muslim whānau. On Saturday this week #Navnation alongside Watene Maori supported mana whenua from our local Araiteuru marae in Dunedin. MP Clare Curran, Mayor Dave Cull, community leaders from multi ethic communities including Pasifika Asian, European. The kaupapa for the day was to reassure the Muslim community and refugees that they were safe in the community and they are supported. #navnation went about their mahi without a second thought or without being asked . From ringawera mahi to sitting and talking to people to help settle them or share a tear with some, it was beautiful to be a part of and see our team showing so much natural aroha and manaaki. Whānau Ora Navigators were then invited into a hui with the community leaders to share, listen and make some suggestions for a big community solidarity event to be held in Dunedin in the next couple of days. Another one of the major kaupapa that has emerged out of this week has been to call for no more racism. From the Prme Minister to the general public, it is a conversation we finally appear mature enough to have. A conversation about the harm done when we make judgements based on our own bias; a discussion we must have about the controls and restraints that should be enforced on groups with racial profiling in their sight – groups like he National Front; the White Supremacist movements and others. One tiny gesture this week made me overcome with embarrassment as I reflected on my own practice. As I boarded a plane a woman in a habib caught my eye and smiled at me. We exchanged a brief rush of warmth – no words were passed but I felt saddened by the realisation that so often, too often, I avoid eye contact with fellow passengers. I am too busy getting into my seat; sorting out the contents of my bag; thinking about what I will be doing when I get to my destination. A simple smile – obscuring the depth of the hurt. A genuine smile – which is the beginning of love. Because of her smile, life just became that bit more beautiful that day. 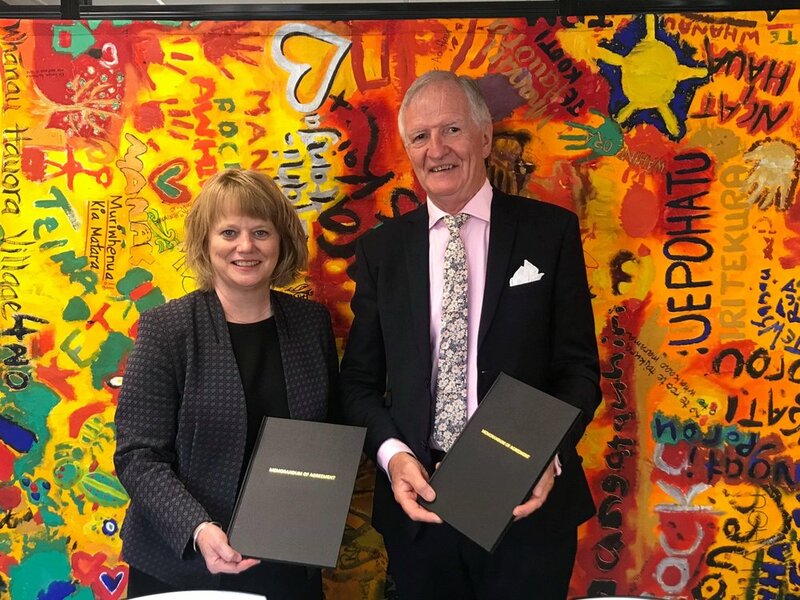 It was very apt that this week, Trish Harrison-Hunt, our Dunedin contracts advisor, took on a key role in hosting the Human Rights Conciliator at Corstorphine Hub in Dunedin. Chief Human Rights Commissioner Paul Hunt was speaking to the Give nothing to racism campaign by having the courage of our convictions. “Sometimes we allow casually racist thoughts, actions and comments into our lives and while we know they’re wrong, we let them stand. This is how prejudice starts. It starts small”. Professor Hunt explained that by giving nothing to racism we refuse to indulge it, we refuse to let it flourish, we refuse to welcome it. On Friday, Trevor Taylor, GPL Board Chair, signed a memorandum of agreement with PHARMAC on behalf of Te Pūtahitanga o Te Waipounamu. :”One of these was whakawhanaungatanga, the joy of relationships and connecting with each other. Another was learning… learning new information, particularly new ways to look after their whānau and about services in the community that could help. Another common theme was Hauora, the fullness of wellbeing. The initiatives focused not only physical health, but on wairua, and not only on dispensed medicines but also on traditional medicines. Another of the common factors were wāiata and the sharing of kai”. This week we share the update on the number of initiatives that have been received for our latest Whānau Ora Commissioning, Wave Nine. The Assessment Panel met this week, including a special meeting with Board Chair, Trevor Taylor, as part of their deliberations. Under the korowai of Te Atiawa, Malcolm Morrison, Lorr Eade and Trevor Taylor – at Te Whiti in front of the maunga Pukeatua. Finally, I end with the beautiful words from a reverted Muslim, Pari-Tyla Harrison-Hunt; he uri no ngā iwi o Ngāi Tahu, Ngāti Porou o Te Atiawa hoki. “My name is Tyla Harrison-Hunt and I am a Muslim. I felt compelled and obligated to post this as a Muslim and as tangata whenua. So, here are my words to you terrorist. You have not weakened us, you have made us stronger. You have not segregated us, you have made us closer. And you have not broken us but created a bond of which muslims and non-muslims alike have created. We are no longer muslims and non-muslims, we are family and we are Cantabrian. You have created Martyrs and heroes out of these people. You will get no recognition, no fame and no retaliation. We as a people, will come out of this as one. A term in which we call kotahitanga. One community.